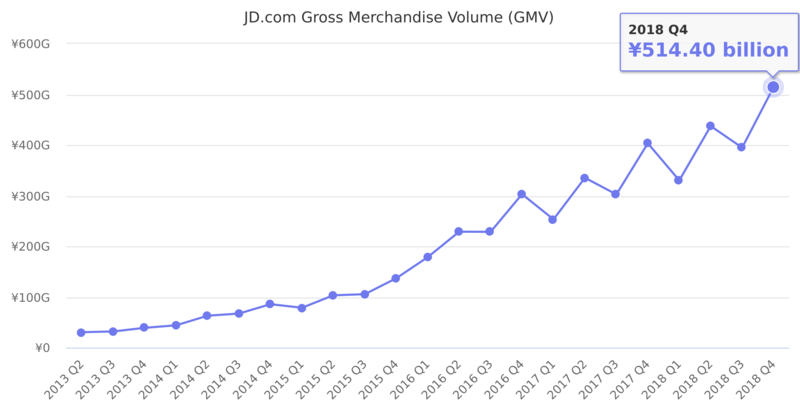 GMV is defined as the total value of all orders for products and services placed in the company’s online direct sales business and on the company’s online marketplaces, regardless of whether the goods are sold or delivered or whether the goods are returned. GMV includes orders placed on our websites and mobile apps as well as orders placed on third-party websites and mobile apps that are fulfilled by us or by our third-party merchants. GMV includes shipping charges paid by buyers to sellers and excludes certain transactions over certain amounts that are comparable to the disclosed parameters in GMV definition by our major industry peer. Last reported quarter 2018 Q4 it was ¥514.40 billion, up by 28% year-over-year from ¥403.40 billion. From ¥1,294.40 billion in 2017 it increased by 30% to ¥1,676.80 billion in 2018.